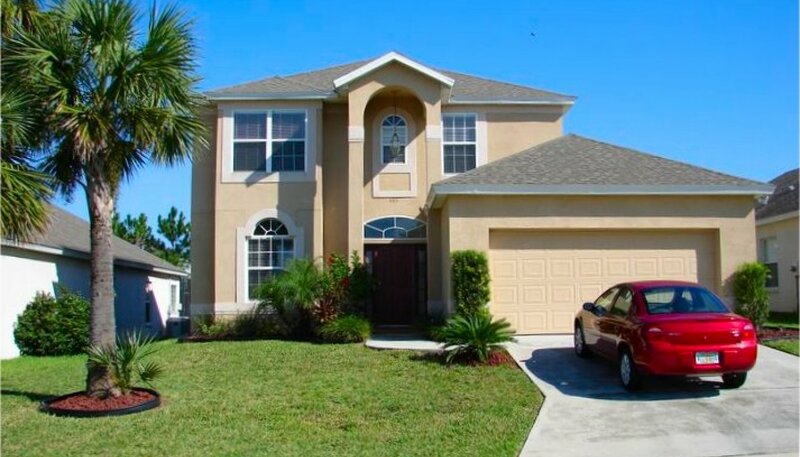 Our villa in Orlando was formerly a show / model home, before becoming a family home, so it is packed with extra luxury features. 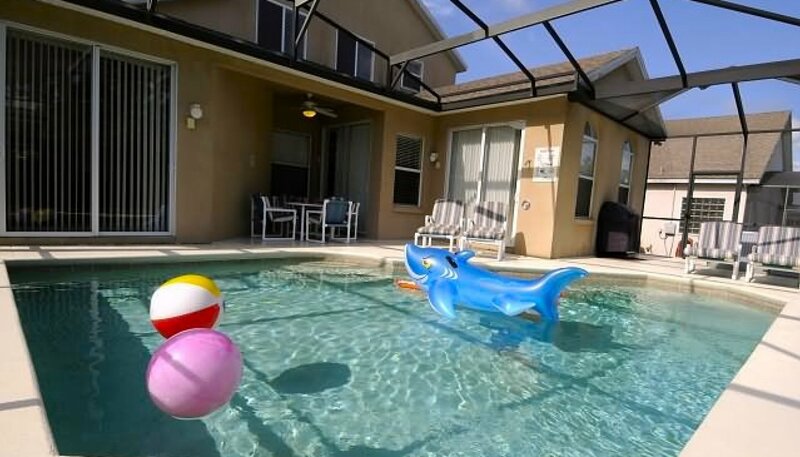 We have provided all new furnishings and all the added extras you would expect from an executive Disney vacation home including a games room, TV's in all bedrooms, free WiFi, Nintendo Wii and large pool with stand-alone Jacuzzi spa - come on.... whats stopping you ? As you enter the villa through the glass doors you are greated with a fabulous tiled hallway with living room to the left and leading off to the dining room on the right. The hallway then leads onto the kitchen and family room beyond. 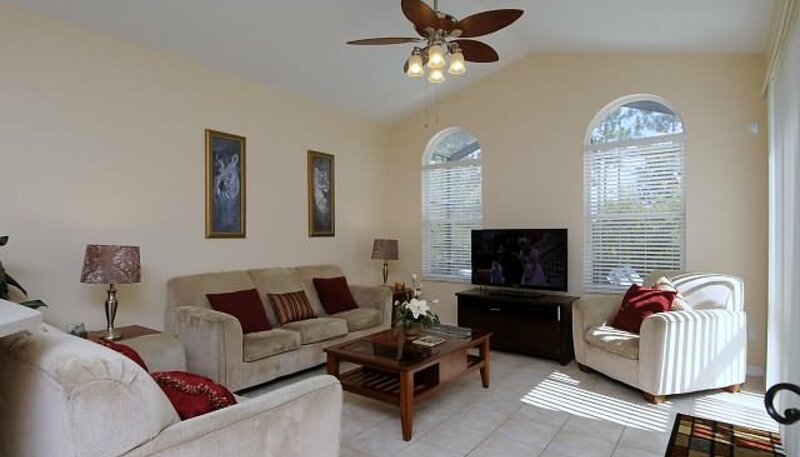 As you enter the villa you find the Living room with 3 sofas with seating for up to 8. It has a cable TV with VCR & DVD player. 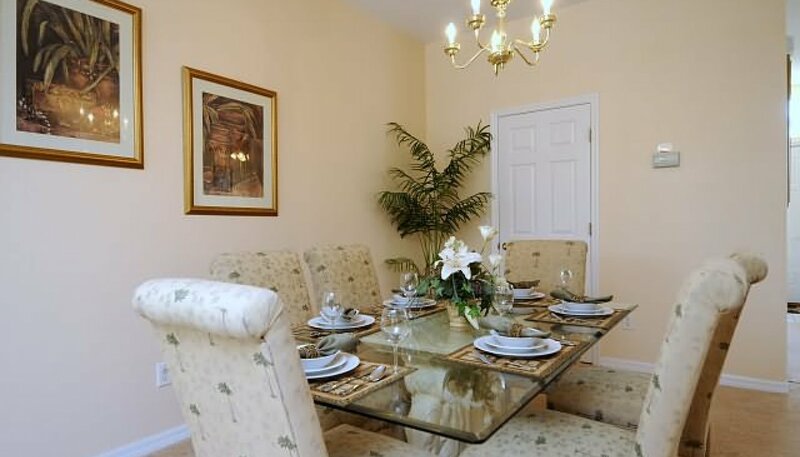 This beautifully decorated tropical theme room offers a large Elephant pedestal dining table with 6 chairs and is ideal for large parties and formal dining. There is a direct access through to the kitchen. 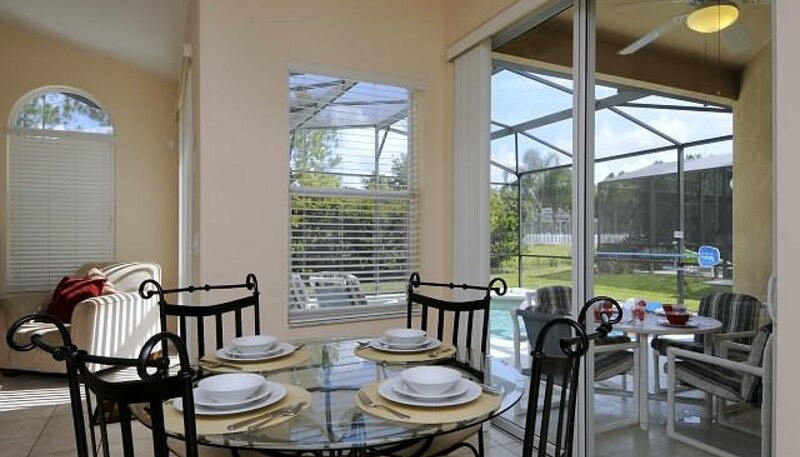 The pleasant breakfast nook overlooks the pool deck. There is a wrought iron table and 4 chairs. 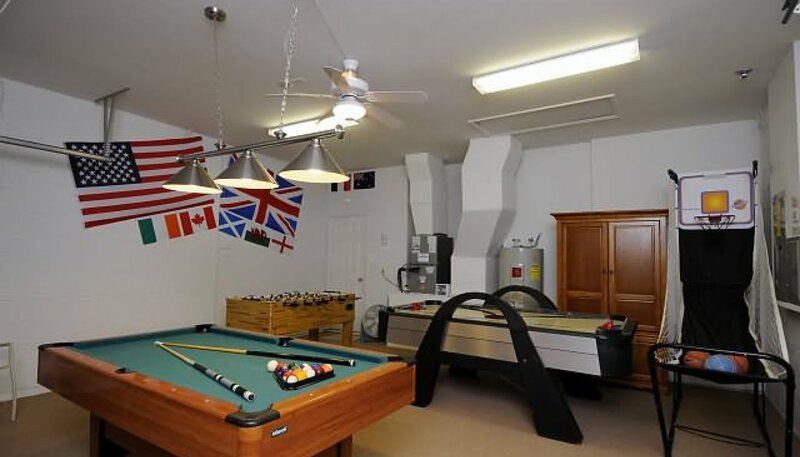 The comfortably furnished room with cathedral ceiling & views to pool deck offers ample seating for you to relax and watch the 46" LCD HD TV with BluRay player or play on the Nintendo Wii games console. There is also a library of DVD movies and Wii games to select from. 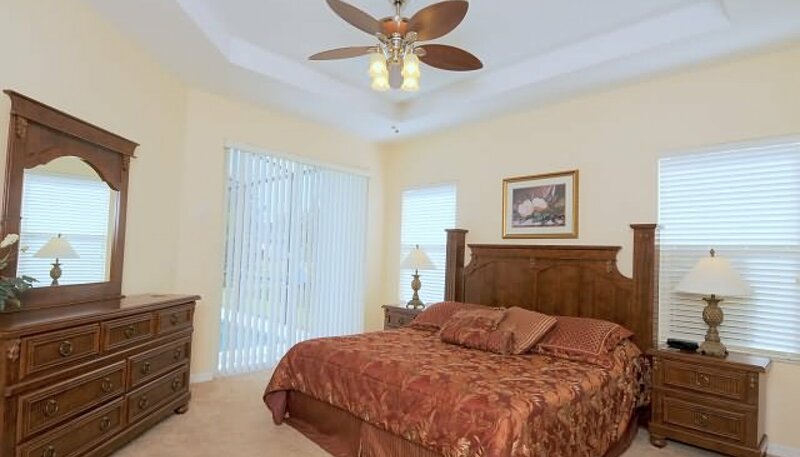 The large master bedroom with vaulted ceiling and wonderful views over the pool deck through sliding patio doors, has been furnished with and a king sized bed, large walk-in wardrobe, 26" LCD HD TV and alarm clock radio. The connecting spacious en-suite bathroom has a large whirlpool spa bath, walk-in double shower with twin shower heads, marble top with his & hers sinks and separate WC. We also provide a hair dryer. 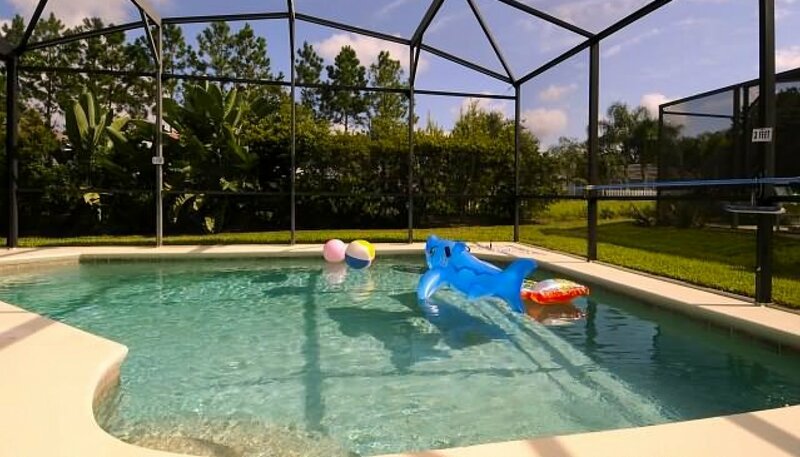 The large private pool with sunny extended deck. We have provided 4 sun loungers for your sun bathing comfort and a patio table with 4 chairs under the shady covered lanai with ceiling fan. For your relaxation after a hard day at the theme parks, why not endulge yourself in the bubbling stand-alone Jacuzzi spa ? We have tried to include everything a young family could wish for in a holiday home such as a cot (crib), highchair & stroller. No need to get stressed on arrival - our villa has an electronic keypad entry system, so if you are delayed at the airport, you can get into the villa anytime of the day or night - no need to travel miles out of your way in unfamiliar territory to collect keys - just pull up on the drive, tap in the 6 digit code and your holiday can begin !! Our villa is maintained by a very responsive and friendly management company located close by. This ensures that all our guests receive the most efficient, friendly and personal service 24/7. We prefer payment in BRITISH POUNDS, however if the booking has been made in US DOLLARS we will convert into BRITISH POUNDS at the prevailing rate, at the time of booking. There is a Publix supermarket 2 miles north on the US27 at Berry Town Center and a Walmart 1 mile further north. At Berry Twon center there is also an Applebees restaurant, Chinese & Indian takeaways, a pizzaria and Irish bar. Coming soon there will be an IHOP. About 15 miles to the south on the US27 there is the very excellent Manny's Chophouse where you can get the most delicious steaks. The second master bedroom with views over pool deck has a queen sized bed, cable TV with VCR, alarm clock radio and walk-in wardrobe. The ensuite bathroom has a bath with shower over, single vanity and WC. We have also provided a illuminated vanity mirror and hair dryer. 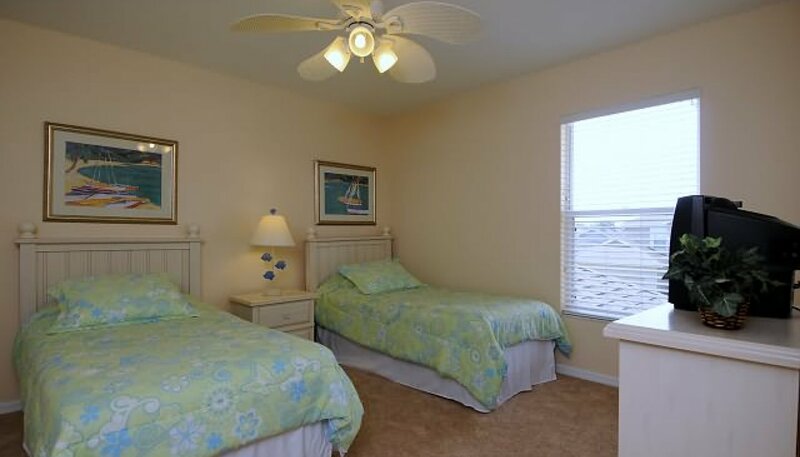 This bedroom features a twin sized beds and is situated next to the third bathroom. 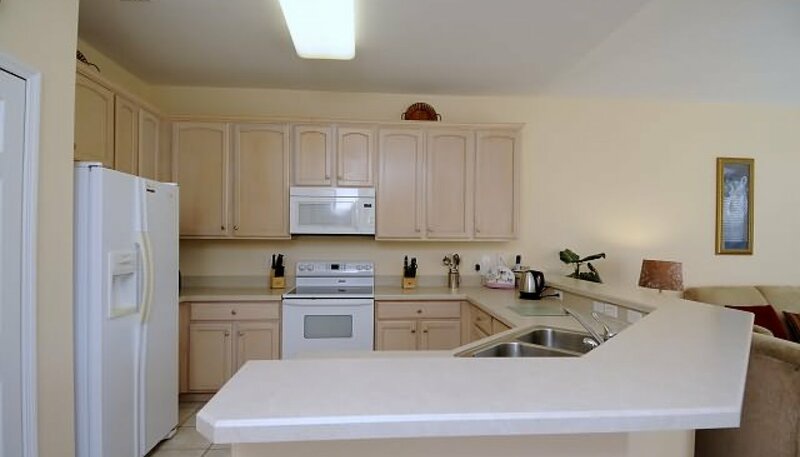 Ample hanging and drawer space is provided along with a cable TV with VCR and ceiling fan for your comfort. 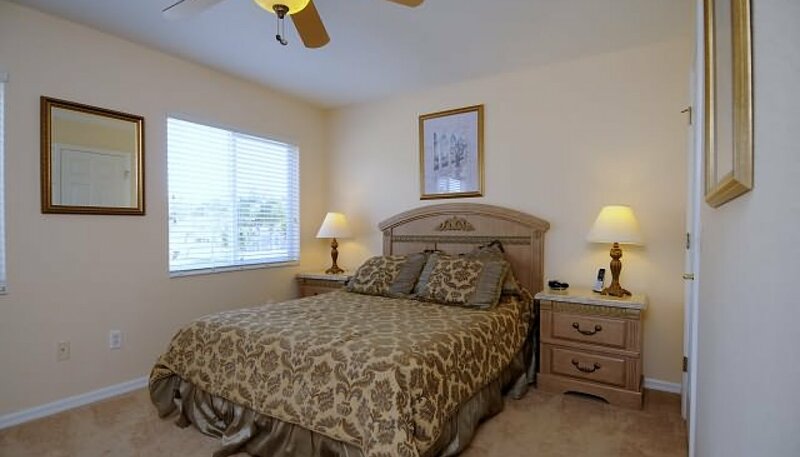 This bedroom features 2 x twin sized beds and is also situated next to the third bathroom. 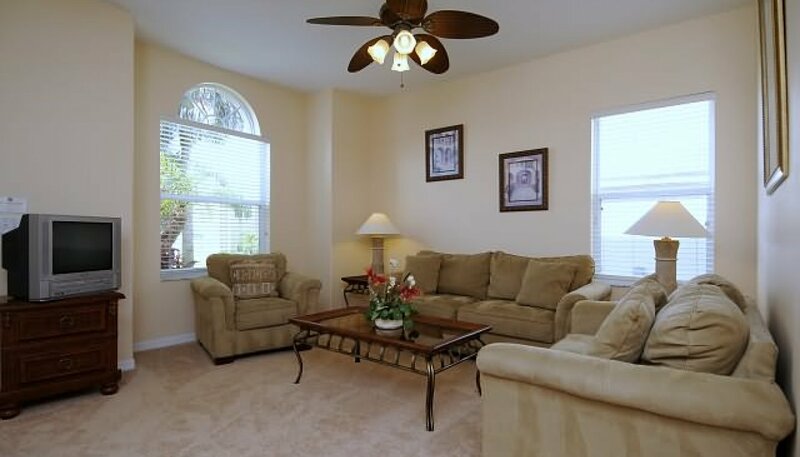 With walk-in wardrobe and chest of drawers along with a cable TV with VCR and ceiling fan for your comfort. 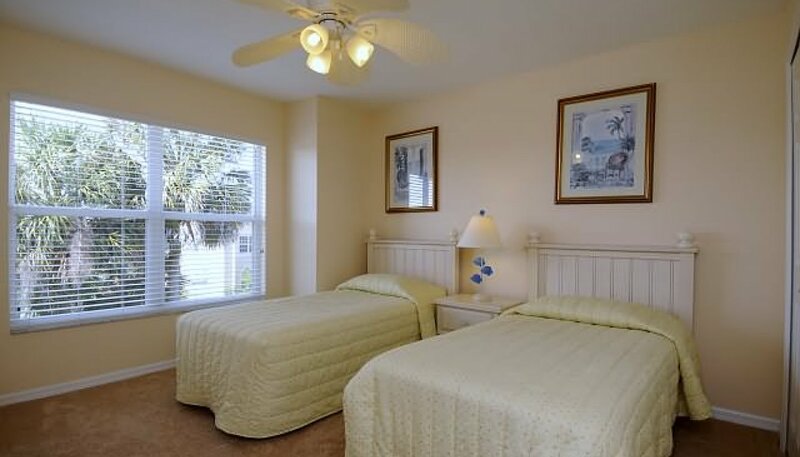 Both twin bedrooms are served by the remaining family bathroom (between the 2 bedrooms). 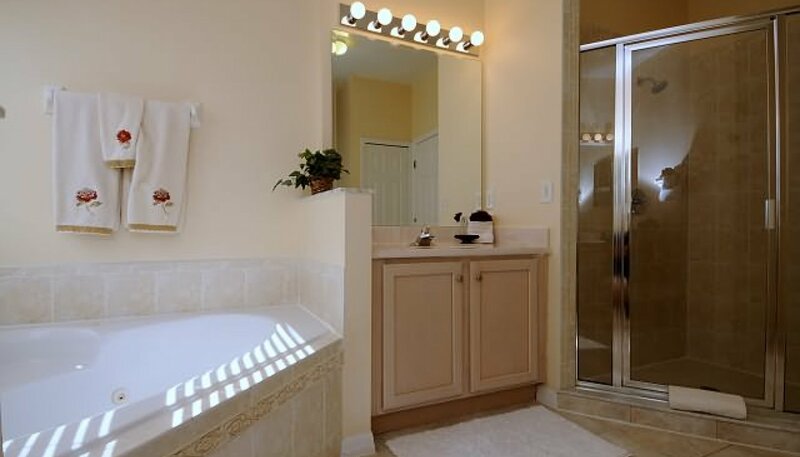 There is a bath with shower over, WC and built-in marble top sink unit.